At the February 2015 Council meeting, Unley endorsed the creation of a local bicycle user group (UBUG). I am enthusiastic about the feedback this group will provide to Council. Cycling is a growing mode of transport and we need to promote it. Unley Council will assist the group in its formation and provide meeting venues. UBUG will be a residents' user group and govern itself without any Council presence or intervention. UBUG will provide feedback on cycle routes and their condition and assist in promoting health and the social benefits of cycling. Time will tell in the merit of assisting in the formation of UBUG. Most of us have a coffee machine at home. The coffee grounds make an excellent fertiliser and should be thrown on the garden or in the compost bin - don't waste them by putting them in the rubbish bin. However, there are other uses. They make an excellent body scrub that rejuvenates the skin. You can use fresh ground coffee or preferably the left over grounds. Mix it up into a grinding paste. Get naked and get into a dry bath. Rub it all over. Be careful around the eyes as the oil may cause irritation. It's even better if someone else gives you the scrub. To avoid too much mess in the bathroom, you could retreat to the garage or garden shed. It's an absolutely refreshing and stimulating cleansing experience. It's something I'm passionate about ... and I know that I'm right. I won't accept the other person's opinion. 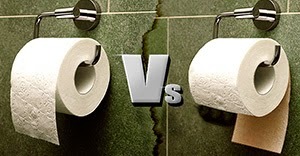 The dilemma (for some) is which way should toilet paper hang - under or over. If I visit someone's home and need to go to the toilet and find that the paper is hanging the wrong way then I will change it. It's a job that needs to be done. There's a minority out there that don't know how to hang their toilet paper. The 1891patent of the inventor (Mr Seth Wheeler) of the toilet paper has been found and it includes diagrams showing how the paper should hang and be dispensed. It's a real relief to know that my way is the right way. It must hang over the roll. View the link below to read more and see the patent diagrams or Google it. Someone was asking me the method of planting and caring for a bougainvillea. An old Queensland farmer once gave me his method. Here’s my advice: Dig a hole and place a dead chook (with feathers) in the bottom. Cover with soil to 4” (10cm) above the chook. Insert the bougainvillea plant and back-fill the soil. Make a water well around the plant. Water weekly for two months and then forget about it. No more water. 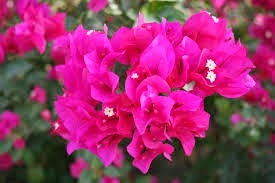 Bougainvilleas thrive without water. They don’t like getting their feet wet. For the best flowering display, cut off the long branches and prune off the tips regularly. Let it get too much growth and there will be less flowers. Years ago, finding a dead chook was no problem. It’s a bit harder these days. I suggest that you discuss it with friends who keep chooks for eggs. Ask them to save a chook when it dies. If you really can’t get a dead chook, then the alternative is to go to your butcher and buy an ox heart or liver. I met with a Labor Federal politician recently at a function. We passed pleasantries, as you do. Talked about issues and what's happening in the Federal sphere. He/She took pride in telling me about being evicted from Federal Parliament by the Speaker, Bronwyn Bishop. For Labor pollies, it seems to be a right of passage (and getting a bit of street cred) to be evicted from Parliament for bad behaviour. Then again, if Labor were in power, the Liberals would be taking pride in getting evicted. In the State Parliament, again the MPs take turns in being evicted for bad behaviour. There's more dignity and discipline. Members are not lining up to get evicted. There's no street cred to be gained. Says a lot about local politics and perhaps the lack of party influence in Councils (in SA). What hasn’t happened is more consultation throughout the community. The average person in the street is not going to send in a submission. My MP has not contacted me (or my neighbours) for our thoughts. I advise the Government to not rush into this. There is no real hurry. Let us consider this over 12 months and then make a considered decision. The Government needs to do a better job in selling the idea. My thoughts are: Stay as we are. It keeps us aligned with Darwin and importantly more aligned with Asian time; and that gives us an advantage over the Eastern States. If a decision is made soon (and in a hurry) then there will probably be a backlash at the next election. Last night I enjoyed another night at the Fringe. Two shows on either side of town. And then a trip home on the tram. We were packed in like sardines in a can. The tram would have to be the most popular (and crowded) public transport in Adelaide. An intoxicated Asian woman got on. She was on her mobile talking very loud, having a one-way conversation. The poor person at the other end. She was oblivious to the world around her. Totally immersed in her conversation. Actually, she had been at our tram stop and had been on the phone for 10 minutes, perhaps longer. A third of the tram followed her conversation with interest and laughter. One person near me very nearly wet herself. The woman had recently got a dog - one of those fluffy shitzu type. If any team beats England at cricket, then all Australia celebrates. We just like the Poms to get beaten. And what a beating it was by Bangladesh in the Cricket World Cup. The Poms are packing up, ready to go home. Cheerio boys! There's often talk about the degree of assimilation of migrants in Australia. The successful assimilation in Australia by Pommy migrants is when they barrack for the Australia cricket team and express delight when England gets beaten. When this measure is achieved the Pommy migrants can then be considered true Aussies. By this measure, the $10 Pom (Unley Councillor) Mike Hudson makes the grade and is a true Aussie. He loves it when England gets beaten. In light of the current religious wars being waged across the globe, I am reminded of a quote in the Bible. God is always on the side of might and right. Always has been. The trouble is that with God on our side (and equally on the side of the opposing force) He loses as many as He wins; simple mathematics. Anyway, it's a powerful quote from the Bible. It reinforces the right to fight for right, justice and beliefs. It also reflects the equal fervour that probably exists on the other side. I abhor bad manners - at work, in the community, at Council, wherever. There's no need for it. To quote Johann Wolfgang von Goethe (aka. Goethe) ... 'a man's manners are a mirror in which he shows his portrait'. A friend (her mother is from Singapore and her father is from Malaysia) gave me a sample of her mother’s homemade Achar. It was superb; absolutely fantastic as a side-dish to a main meal. It keeps ok in the fridge for 2 weeks.I was so impressed that I asked for the recipe. The problem was that the mother did not have it written down; it was in her head. So the daughter helped her Mum make the next batch and recorded the process.